"Our business will grow our pension and the children's inheritance money faster than almost any other investment"
When Chancellor George Osborne introduced Pension Freedoms in April 2015, Andrew and Philippa Tarling could not have imagined this would spark a new career as luxury ice cream makers. But, with the help of Pension-led funding (PLF), two family windfalls and 25 years’ experience in the pub trade, that’s exactly what happened to the couple who have joined the new wave of olderpreneurs. Both Andrew and Philippa had plenty of financial acumen, having left successful roles in the City with major independent banks before taking on a country pub in Horsington, Somerset. Although successful, with the UK’s pub trade in decline the couple knew they would have to diversify and were looking to offer food. 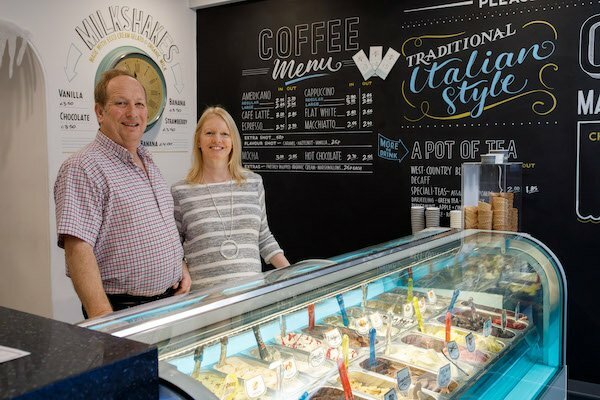 After reading about a publican in the North of England offering Gelato, Andrew sent Philippa on a ‘taster’ course at the UK headquarters of Carpigiani, the world’s largest supplier of gelato making machines. For the uninitiated, gelato is ice cream made the Italian way, with only the best milk and ingredients and is lower fat than regular ice cream. For vegans, there’s sorbetto which, according to Philippa, tastes just as good as the milk-based version. But making gelato comes at a price. “We thought we could just buy a machine for about £3,000, set it up in the pub and go from there. But, unsurprisingly, it wasn’t that simple”, Andrew explains. It was clear there was a lot more involved in making top quality ice cream and it was going to need the best machinery and stand-alone premises. The costs quickly escalated. The Tarlings saw their pensions as an opportunity to expand their horizons but, rather than simply cash them in, they sought an approach. They met with Clifton Asset Management and recognised Pension-led funding (PLF) as the solution. The pension pot was placed in a SSAS set up by Clifton which allowed the Tarlings to back their own business. Their pension scheme loaned them £75,000 secured against the gelato machinery, along with £40,000 in cash from two windfalls. The Tarlings decided on an interest rate of 12% so that the loan could be paid back to the pension fund more quickly, and experience further growth. “It’s all about the money in the end, and with the money being made by the business only being owed back to our own pension fund it’s a perfect circle”, says Andrew. “The inheritance money was on deposit at 2.25% and my pension was going to give me about £100 a week and that doesn’t get you very far. It was clear to us as ageing professionals that PLF would work and Clifton were very efficient in the way they sorted it out”, says Philippa.